Al Turgeon, a senior administrator at the University of Vermont, spent 24 years in the United States Army on active duty. He served in Alaska, Illinois, Kansas, Colorado, South Korea, Germany and the Middle East as an infantry officer with a specialty in operations, planning and training. His career also included two non-tactical assignments in Vermont as a Reserve Officers' Training Corps instructor. Wherever possible, Turgeon opted to settle his family into a private home rather than military housing. And in each scenario — for a total of five homes — the Veterans Administration made the mortgage possible. Through its program, the VA serves as a guarantee for a home loan that enables lenders, such as banks or credit unions, to offer financing with no down payment or mortgage insurance and very low interest rates. Veterans, and those still enlisted, must provide a certificate of eligibility as proof of military service to qualify. Turgeon first learned about VA loans in 1986 while teaching at Norwich University. He was 27 and married with two sons, ages 4 and 2 (a third son came later). They had little cash to spare. Still, Turgeon wanted to put down roots even though his military career would inevitably pull them up again. The young family found an affordable place in Northfield and took up residence for five years — courtesy of a VA loan and sweat equity. "It was an old farmhouse with a lot of deferred maintenance," Turgeon recalls. "The low-cost loan helped me save resources for fixing things that needed to be done while allowing me to invest in a home." Since then, Turgeon has used VA loans to purchase a new dwelling in Fort Leavenworth, Kan., a contemporary house in Colorado Springs and a clapboard home in an established Essex neighborhood. "In every respect," Turgeon says, "I've been able to save a substantial amount of money because of the low transactional costs associated with a VA loan." For those interested in following suit, he has a few suggestions. "Get yourself a lender that has processed VA loans. You want to depend on someone who is very knowledgeable," he advises. "And make use of the VA website or a benefits counselor for details on the process as well as the certificate of eligibility." Jon Templeton, a real estate agent with Larkin Realty who served in the U.S. Navy from 1984 to 1990, encourages anyone who qualifies to make use of what he believes is an exceptional value. "The VA loan program is an awesome benefit for our military families," he says. "I don't see any reason why a veteran wouldn't want to take advantage of it." Templeton gives an example of one Vermont community in which veterans have done just that. In the last few years, approximately 30 percent of new homeowners in St. Albans' Harborview and Pineview Estates — which are Larkin Realty and Fitzgerald Development projects — have used VA loans to purchase their properties, he says. But considering the large number of veterans in the state, VA loans could be utilized more, says Barb McHenry, senior loan officer with Fairway Independent Mortgage in South Burlington. "Vermont has the highest per capita deployment of National Guardsmen," she notes. Fairway hosts a number of annual events to honor Vermont's retired and active military personnel, including a pizza giveaway on Veterans Day in coordination with Leonardo's Pizza in South Burlington and Mimmo's Pizzeria & Restaurant in St. Albans. These events also bring attention to the benefits and services available for vets interested in buying a home. There's a "giving back" component to the efforts, as well. "Fairway Mortgage has a nonprofit called the American Warrior Initiative to which we donate throughout the year," McHenry says. At an October event, the company taught 30 real estate agents how to better serve veterans. "We raised and donated $10,000 for a deserving local veteran," says McHenry. John Abry, an agent with RE/MAX North Professionals, is spearheading a list of Chittenden County real estate partners who are part of a national rebate program called Heroes Home Advantage. It offers cash, credits and discounts to anyone who protects and serves — from members of the military and law enforcement to firefighters, health care workers, first responders and teachers. A website connects applicants with real estate agents, lenders, title companies and attorneys in their communities. VA loans are listed as areas of expertise for nearly every state, including Vermont. After Turgeon divorced and retired from the Army, he began a second chapter in his life with a new spouse and a new home. Yet he continued making use of the "huge financial benefit" of the VA loan process. 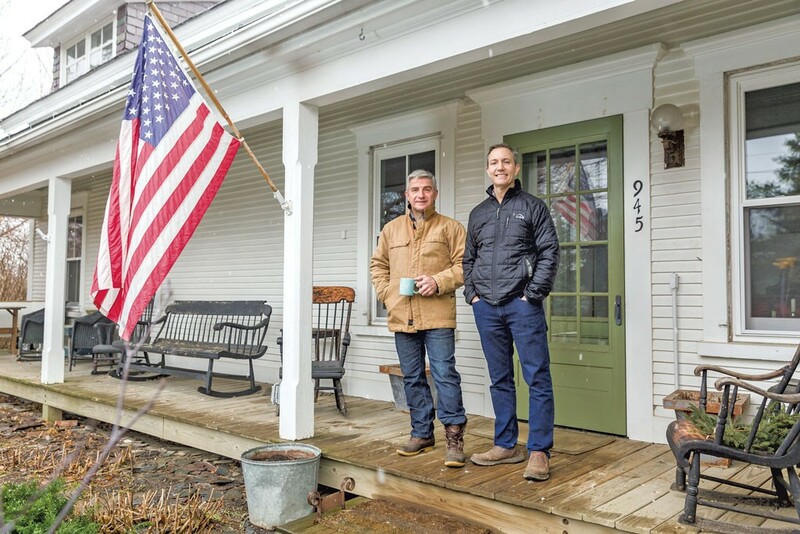 Twenty-one years after purchasing his first house in Northfield, he bought a historic Williston farmhouse where he now resides with his partner, Joe Haller. The couple married on the property's grounds in 2010 and intends to live there happily ever after — thanks in part to the VA's sweet loan program. The original print version of this article was headlined "Loan, Sweet Loan"